the way, they were not long upon the road. It was easy to guess ' that they had come to the right place, for they saw peacocks in every tree, and their cries could be heard a long way off. "When they reached the city they found it full of men and women who were dressed entirely in peacocks' feathers, which were evidently thought prettier than anything else. at full speed by twelve peacocks. 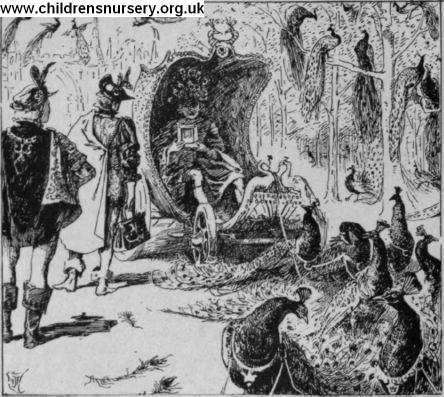 The King and the Prince were delighted to see that the King of the Peacocks was as handsome as possible. lie had curly golden hair and was very pale, and he wore a crown of peacocks' feathers.